Evidence Action's No Lean Season is a program we have recommended funding to in the past as part of our Incubation Grants program and as a top charity. Due to research results that did not find an impact of the program in 2017, Evidence Action is currently conducting further research and is not currently seeking additional funding for the program. Evidence Action's No Lean Season stands out from the vast majority of organizations we have considered for its unusually strong self-analysis and transparency. We expect to continue to follow its progress and, depending on results of its further research, may recommend further funding to the program at a later time. Is there room for more funding? Evidence Action is not currently seeking additional funding for the program. It plans to use funding it has previously received for No Lean Season to continue running and evaluating the program over the next few years. What is the evidence for the effect of conditional subsidies for seasonal labor migration on migration behavior and household income and consumption? How is the program different from the intervention studied? What are Evidence Action's plans for continuing to evaluate the impact of the program? Making several grants to No Lean Season as part of our work to support the development of potential future GiveWell top charities (now known as GiveWell Incubation Grants). For more information, see our reports on a March 2014 grant to No Lean Season and several subsequent grants. Reviewing documents No Lean Season sent in response to our queries. Visiting No Lean Season in Bangladesh in September 2017. We added No Lean Season to our list of top charities in November 2017. In mid-2018, Evidence Action shared preliminary results from the 2017 RCT with us. We and Evidence Action agreed that No Lean Season should not be considered a GiveWell top charity in 2018, and Evidence Action told us that it was not seeking additional funding for No Lean Season at the time and would spend available funding implementing the program and conducting further research in 2019-2020. All content on No Lean Season, including past grants, blog posts, and conversation notes, is available here. We have also published a page with additional, detailed information on No Lean Season to supplement some of the sections below. This section describes the roles played by organizations involved in the program, details of how the program is implemented, and how funding for the program is spent. Note that when we refer to program activities in a particular year, this refers to the implementation of the program targeting the lean season in the fall of that year, with program activities extending into the following calendar year. For example, loan recovery for the No Lean Season program in 2017 extends into March 2018. See also our report on conditional subsidies for seasonal labor migration in northern Bangladesh. No Lean Season is implemented by RDRS Bangladesh and most staff who work on No Lean Season are employed by RDRS. Evidence Action developed No Lean Season and plays a range of ongoing roles in the program, described below. Innovations for Poverty Action conducts evaluation activities, of which Yale professor Mushfiq Mobarak is the Principal Investigator. Evidence Action was created out of Innovations for Poverty Action (IPA) in 2013 with a mission to scale cost-effective and evidence-based programs. Two IPA initiatives, the Deworm the World Initiative (one of GiveWell's top charities) and Dispensers for Safe Water (one of GiveWell's standout charities), were spun off from IPA to be managed by Evidence Action.13 It has since built a department for investigating, testing, and considering new programs for scaling up called Evidence Action Beta;14 one program in the Beta portfolio is No Lean Season. Evidence Action leads the strategic direction and program management of No Lean Season, provides technical assistance, mobilizes resources, and conducts program monitoring independent of RDRS.15 Evidence Action also coordinates research partnerships for ongoing experimental evaluation of the program and for further optimization of the program design.16 As of late 2017, two Evidence Action staff members were based in Bangladesh and worked full time on No Lean Season.17 In 2017, Evidence Action hired a team of part-time monitors.18 (See below for more on Evidence Action's monitoring of No Lean Season.) Evidence Action is in the process of exploring whether the program could scale in other contexts (more). Details are on our page with additional information about No Lean Season. We summarize No Lean Season's 2016 and 2017 spending in this spreadsheet. No Lean Season spent &dollar;3.1 million in 2017, up from approximately &dollar;0.9 million in 2016. Of 2017 spending, 88% was for the Bangladesh program and 12% was for work in Indonesia. 40% was grants to RDRS, 31% was personnel and related costs and contract services, 7% was grants to Innovations for Poverty Action for research expenses, 7% was grants to partners in Indonesia, and 15% was Evidence Action's indirect costs. The program disbursed &dollar;0.76 million in loans and recovered 91% of the loan capital. The impact of subsidies for seasonal labor migration in northern Bangladesh on rates of migration and household income or consumption as evaluated in four RCTs. Evidence Action's plans for further research on the impact of the program. The key questions we would have about the impact of the program on an ongoing basis (particularly in years where the program is not evaluated with an RCT) and what processes No Lean Season has used to gather information on these questions. RCTs conducted in 2008 and 2014 found strong impact of the program on the number of people who migrated to find work during the lean season and on household income and/or consumption during the lean season in which participants received subsidies. There was also evidence of higher rates of migration in the 1 to 3 years following program participation, without further subsidies. RCTs conducted in 2013 and 2017 did not find significant increases in the number of people who migrated to find work in the lean season. We put more weight on the 2017 RCT than on the other RCTs because the scale of the program was much larger than in the prior RCTs and therefore more closely resembles how the program is likely to operate in the future. In sum, when the program succeeds in inducing higher levels of migration, there is relatively strong evidence that this leads to increases in household income and consumption. The program has not consistently caused higher levels of migration, and it is not yet clear whether this is due to details of program implementation that can be adjusted to achieve more consistent results on migration rates or to conditions that are outside the program's control and/or ability to predict. As described in our report on conditional subsidies for seasonal labor migration, we rely on the following studies to inform our view of the effectiveness of the intervention: a 2008 RCT with follow-up in 2009, 2011, and 2013; an unpublished 2013 RCT about which we have relatively little information; a 2014 RCT with follow-up regarding remigration in 2015; and a 2017 RCT, which has not yet been published. In this section, we discuss how similar the program was in 2017 to the intervention that was evaluated in the 2008 and 2014 RCTs, the previously conducted RCTs of conditional subsidies for seasonal labor migration. We believe that the No Lean Season program is highly similar in context and operation to the intervention in the key studies that inform our evaluation. RDRS and Evidence Action expect to continue to make some changes to the implementation of the program over time, but we do not currently expect changes to the core characteristics discussed below. Geographic context. All of the studies that we rely on took place in Rangpur Division, Bangladesh.33 Because RDRS' presence is predominantly in Rangpur Division, we expect that No Lean Season predominantly plans to scale up within Rangpur Division, though it may plan to scale up in other areas of Bangladesh in the future.34 Our understanding is that there is a seasonal decline in consumption for low-income households throughout Rangpur Division.35 We are uncertain about the heterogeneity of relevant factors within Rangpur Division, such as the degree of seasonality in consumption or the baseline prevalence of seasonal migration. We have not examined the village-level heterogeneity of the RCT results. Additional conditionalities. In the 2008 experiment, some households were assigned a migration destination or a migration group.44 This is not the case in the No Lean Season program. Conduct an RCT of the program during the 2018 season. Our understanding is that the RCT will measure the program's impact on migration rates and household income and/or consumption. Conduct additional non-RCT research in Bangladesh and Nepal and complete analysis of non-RCT research from Indonesia in order to better understand the conditions that affect the impact of the program. We have not yet asked Evidence Action for details of this work. Do program participants receive and repay the correct loan amount? Are there cases of fraud in loan disbursement and repayment? There appear to be reasonably strong processes in place to prevent fraud. In almost all cases, loans are disbursed at RDRS branch offices, and two RDRS staff are present during all disbursements.52 To monitor whether participating households receive the correct loan amount, Evidence Action's monitors observe a sample of disbursement days and interview a random sample of loan recipients immediately after they go through the disbursement process.53 Evidence Action shared details of how this data was collected and datasets from 2017.54 We are not aware of a process to monitor for cases in which Migration Organizers or other RDRS staff collect more than the loan amount in loan repayments, for example, by failing to record in the system that the loan has been repaid and asking recipients to repay the loan twice, or telling recipients that they are expected to repay the loan with interest. Are people who migrate exposed to greater physical and other risks during migration than at home? As far as we are aware, No Lean Season's current monitoring processes do not include information addressing this question. In 2017, we created a model of the cost-effectiveness of No Lean Season. With the information available at the time, our model estimated that No Lean Season was in the range of cost-effectiveness of our other top charities.59 The 2017 model does not take into account results of the 2017 RCT. We have not fully updated this model in 2018. In particular, we have not completed an analysis of the cost per participating household based on No Lean Season's 2017 costs and projected future costs. Depending on the outcome of research in 2018-2019 on the program's impact on migration rates and household income and consumption, we may fully update our cost-effectiveness analysis in 2019. &dollar;9.8 million for implementation in Bangladesh in 2018-2020. &dollar;1.6 million for program management costs in 2018-2020 not attributed to the Bangladesh program. &dollar;0.8 million to fund an RCT of the Bangladesh program in the 2018 lean season and &dollar;0.3 million in costs not yet paid for the 2017 RCT. &dollar;0.4 million for non-experimental research in Bangladesh. &dollar;0.4 million to "[finalize] lessons, engage partners, [and] pivot to next steps" in Indonesia. &dollar;1.1 million to provide support to an RCT of the program in Nepal. We have had additional conversations from which we have not published conversation notes. "The cropping patterns in Bangladesh are delicately balanced within the natural cycles of rains and annual floods. Thus, farmers' production options and perception of risk are often determined by the physical environment: the degree of seasonal flooding, the timing and quantity of rainfall, and the soil characteristics (Mahmud, Rahman, and Zohir 1994, 2000)." Khandker and Mahmud 2012, Pgs 40-41. See especially figure 3.4, "Crop Calendar of Major Crops," which illustrates that no other major crop activities occur while the aman rice crop is in its growing period from September to November. In particular, Khandker and Mahmud 2012 discuss seasonal patterns of income, expenditures, and poverty on Pgs 43-61, based on the authors' analysis of data from the Household Income and Expenditure Survey of the Bangladesh Bureau of Statistics, showing marked dips in income and consumption in the lean season. See especially data on seasonal employment patterns on Pg 60, showing that household employment in the farm sector varies seasonally from a peak of approximately 17 person-days per month to a low of approximately 8 person-days per month in the lean season. Bryan, Chowdhury and Mobarak 2014, Pg 1676 shows seasonal variation in total expenditures per capita, food expenditure per capita, price of rice, and quantity of rice per household based on the Household Income and Expenditure Survey of the Bangladesh Bureau of Statistics. "No Lean Season addresses seasonal poverty by offering a migration subsidy of about &dollar;20 to participating households, covering the cost of a round-trip bus fare to nearby urban areas that do not experience the same seasonal fluctuations in job opportunities." Evidence Action webpage: The solution: No Lean Season. From conversations with Evidence Action Beta staff, it is our understanding that the costs of transportation may vary and that the loan amount is intended to be large enough to additionally allow migrants to set aside some money for family members staying behind. "Following the success of the loan provision for seasonal migrants, we have piloted the project NLS in 15 branches for 7000-9,000 seasonally-unemployed adults who can borrow Tk 1,500 each on an interest-free basis." RDRS Bangladesh 2016 Annual Report, Pg 49. The loan amount of 1500 taka is built in to No Lean Season Budget Projections, unpublished tab. 1500 taka was worth &dollar;17.89 USD as of August 31, 2018, according to Google. No Lean Season Research Timeline illustrates the history of research studies related to the No Lean Season project prior to 2017. We do not list the 2011 RCT here because it was conducted in the "lesser lean season." We discussed the 2017 RCT with No Lean Season several times over the course of 2017 and 2018. "In 2016, we decided to work with 15 of 164 Branch Offices (as agreed in the MOU with RDRS). This was an increase from previous years, but a number that felt appropriate in terms of overall budget and implementation capacity." No Lean Season 2016 summary of data (guide), Pg 2. In 2016, No Lean Season operated out of 15 RDRS branch offices "geographically dispersed throughout the target program area in northern Bangladesh." No Lean Season 2016 summary of data (guide), Pg 2. "The landless poor supplying agricultural labor on others' farms are especially affected when demand for agricultural labor falls. They constitute around 56% of the population in our sample area, and are the target of the seasonal migration encouragement intervention that we design. Our sampling frame is representative of this landless population in the Rangpur region of Northern Bangladesh. According to the Bangladesh Bureau of Statistics, there are roughly 15.8 million such inhabitants in Rangpur (BBS, 2011)." Akram, Chowdhury and Mobarak 2017, Pg5. "The experiment was conducted in 133 randomly selected villages in Kurigram and Lalmonirhat districts of Rangpur," Akram, Chowdhury and Mobarak 2017, Pg 7. 2008 RCT (and its follow-up surveys): "Our experiments were conducted in 100 villages in two districts (Kurigram and Lalmonirhat) in the seasonal-famine prone Rangpur region of northwestern Bangladesh." Bryan, Chowdhury and Mobarak 2014, Pg 1675. "RDRS is unusual is maintaining a concentrated geographic program, focusing on 8 districts and 57 Upazilas (sub-districts) mainly in deprived north-west Bangladesh in Rangpur Division, far from the overcentralized economic and political powerbase of Dhaka, Chittagong, even Rajshahi." RDRS Bangladesh webpage: Where We Work, which also includes a map of areas where RDRS works, showing a geographic emphasis on Rangpur Division. No Lean Season operates under the microfinance arm of RDRS: "No lean season (NLS); Following the success of the loan provision for seasonal migrants, we have piloted the project NLS in 15 branches for 7000-9,000 seasonally-unemployed adults who can borrow Tk 1,500 each on an interest-free basis." RDRS Bangladesh 2016 Annual Report, Pg 49, under the heading Microfinance. See GiveWell's summary of No Lean Season's 2016 spending for a summary of RDRS's 2016 budget, including line items for "Salary and allowances" and other operating costs. Administrative data is collected by the RDRS in the course of implementation. This includes training attendance, household listing, offer attendance, migration compliance checks, loan recovery etc. Some key forms are digitized and collected using electronic data collection. Verification data is collected by Evidence Action from a sample of respondents or site observations in order to confirm that various program process have been performed effectively and in adherence to protocol. The sampling plan, which is still under development, details the sampling approach to be used for verifying each phase of the program and is summarized on the third tab here." No Lean Season 2017 Process and Performance Monitoring Framework, Pg 2. "Evidence Action Beta is our in-house incubator of promising, evidence-based innovations. Beta exists to design, prototype, test and deliver measurably impactful, cost-effective programs that are ready for scaled implementation by Evidence Action and our partners." Evidence Action webpage: What is Evidence Action Beta? We met these two staff members during our 2017 site visit to No Lean Season. "This year, Evidence Action started employing university Masters’ students as part-time independent monitors (also called “enumerators”) for No Lean Season. Evidence Action is still in the process of developing its monitoring processes. We met with 8-10 of these enumerators and asked them about their work. Most or all of the enumerators found out about the job because Mr. Rana recruited from their university. They had recently completed monitoring of the household targeting survey." GiveWell's 2017 site visit to No Lean Season, Pg 8. 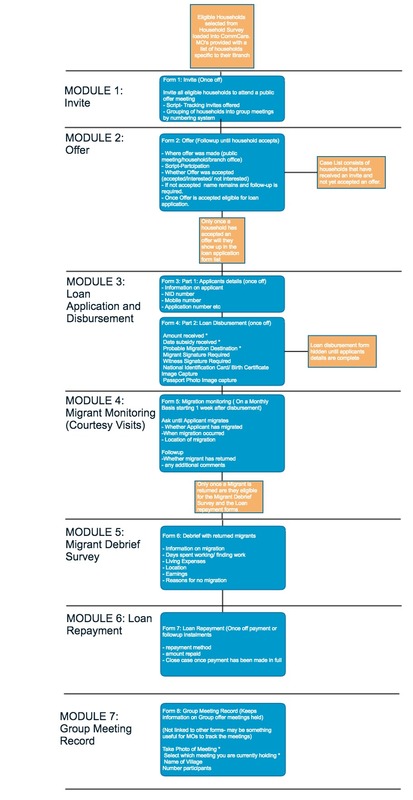 "RDRS' Migration Organizers deliver the program at the last mile. They conduct village and household surveys, inform prospective migrants about the benefits and risks of migration, extend offers to eligible households and participate in loan recovery." No Lean Season 2017 Process and Performance Monitoring Framework, Pg 2. "The risk of fraud during the disbursement process is mitigated by the presence of both the Migration Organizer and the branch office manager for every disbursement." GiveWell's 2017 site visit to No Lean Season, Pg 6. "To verify that someone has migrated, the Migration Organizer asks an average of three neighbors whether the person has migrated. If they haven't migrated, the Migration Organizer asks the recipient when they will migrate. If the participant previously indicated plans to migrate with someone else, that person is contacted for verification." GiveWell's 2017 site visit to No Lean Season, Pg 7. "In 2016 there were 30 Migration Organizers, 21 of whom were invited to continue this year." GiveWell's 2017 site visit to No Lean Season, Pg 17. "In 2017, RDRS hired 102 Migration Organizers for No Lean Season out of about 1,000 applicants and left roughly one candidate in the reserve pool for every candidate hired." GiveWell's 2017 site visit to No Lean Season, Pg 17. For example: "If the [CommCare] app isn't working, Migration Organizers are supposed to restart the phone and wait five minutes. If it still doesn't work, they are supposed to update their phone or call the monitoring officers to let them know." GiveWell's 2017 site visit to No Lean Season, Pg 4. In a comment on a draft of this review on November 9, 2018, Evidence Action noted that Monitoring Officers are now referred to as Implementation Officers. Evidence Action provided us with this list of management staff. We have seen RDRS budgets for No Lean Season including salary & allowance line items for Senior Management, a Project Manager, Branch Managers, and Area Managers (Evidence Action No Lean Season - 2016 Program Round Actual Expense Breakdown (Unpublished), "2016 report for GiveWell" tab). We met several of these individuals during our 2017 site visit to No Lean Season. "Ongoing management and leadership costs at the country, regional, and global levels necessary to support ongoing program delivery and growth as per three year plan. Focus on establishing and building scale at minimum marginal cost in existing context; maximizing impact and efficiency; mitigating risk and minimizing unintended consequences"
"Ongoing communications, donor management, policy engagement, and other operational costs related to the three-year plan in Bangladesh." The table shows to what extent various staffing categories are full-time staff or part-time staff. "The budget should include everything we would spend on the program to deliver, monitor, assess, and manage it in Bangladesh -- the fully-loaded costs of the program that delivers the impact and corresponds to the creation of benefits as assessed in the model. "The budget should also include all monitoring and evaluation costs related to assessing the path-to-scale and ongoing delivery-at-scale of the program in Bangladesh, assuming a runway / decision-making time horizon of ~3 years." "Evidence Action has two staff members in Bangladesh, both based at RDRS’s headquarters in the city of Rangpur: Sohel Rana, who has been working for Evidence Action for about a year and is its most senior staff member in Bangladesh, and Rayhanul Islam, who has been working for Evidence Action for about a month. Both Mr. Rana and Mr. Islam previously worked for IPA." GiveWell's 2017 site visit to No Lean Season, Pg 2. No Lean Season uses CommCare (https://www.dimagi.com/products/), an open source mobile data collection and case management platform. In 2017, Evidence Action Beta worked with AgImpact (https://agimpact.org/) to develop a No Lean Season mobile data collection app on the CommCare platform. CommCare was selected for its features such as low reliance on data connectivity and support for the Bengali alphabet. GiveWell's 2017 site visit to No Lean Season, Pgs 3-4. Conversations with Evidence Action staff. No Lean Season CommCare Design Graphic. Although this graphic does not include targeting surveys, Evidence Action has told us that the CommCare mobile application also includes modules for targeting surveys (village survey and household survey). We believe we learned this in a June 11, 2018 call with Evidence Action, though we aren't confident of the date. "Finalize Indonesia lessons, engage partners, pivot to next steps"
"Support of / engagement with Nepal RCT, MM". We believe "MM" refers to Mushfiq Mobarak. "The landless poor supplying agricultural labor on others' farms are especially affected when demand for agricultural labor falls. They constitute around 56% of the population in our sample area, and are the target of the seasonal migration encouragement intervention that we design. Our sampling frame is representative of this landless population in the Rangpur region of Northern Bangladesh. According to the Bangladesh Bureau of Statistics, there are roughly 15.8 million such inhabitants in Rangpur (BBS, 2011)." Akram, Chowdhury and Mobarak 2017, Pg 5. "The experiment was conducted in 133 randomly selected villages in Kurigram and Lalmonirhat districts of Rangpur." Akram, Chowdhury and Mobarak 2017, Pg 7. We are also aware of an unpublished study from 2013, which we discuss in our intervention report. No Lean Season Budget Projections, tab "Budget Projections" shows projected growth in "Total # of Branch Offices." The number of branch offices in which No Lean Season projects operating by 2022 exceeds 171, the total number of RDRS branch offices as of 2016 (see table row "Total Branches," RDRS Bangladesh 2016 Annual Report, Pg 53), and continues to grow at a rate of 10 per year. RDRS works predominantly in Rangpur: "RDRS is unusual is maintaining a concentrated geographic program, focusing on 8 districts and 57 Upazilas (sub-districts) mainly in deprived north-west Bangladesh in Rangpur Division, far from the overcentralized economic and political powerbase of Dhaka, Chittagong, even Rajshahi." RDRS Bangladesh webpage: Where We Work, which also includes a map of areas where RDRS works, showing a geographic emphasis on Rangpur Division. In particular, Khandker and Mahmud 2012 discuss seasonal patterns of income, expenditures, and poverty on Pgs 43-61, based on the authors' analysis of data from the Household Income and Expenditure Survey of the Bangladesh Bureau of Statistics, showing marked dips in income and consumption in the lean season. See especially the figures in this section, showing seasonal trends in both Rangpur and the rest of Bangladesh. Evidence Action has confirmed for us that households were eligible for the No Lean Season program in 2017 if they reported owning 50 or fewer decimals of land or reported any incidence of skipped meals in the two weeks preceding the eligibility survey. Eligibility criteria in the 2014 RCT: "The experiment was conducted in 133 randomly selected villages in Kurigram and Lalmonirhat districts of Rangpur. We first conducted village censuses to identify all households that would be 'eligible' to receive this intervention in each of these villages. A household was deemed eligible if (1) it owned less than 0.5 acres of land, and (2) it reported back in 2008 that a member had experienced hunger (i.e., skipped meals) during the 2007 monga season. We focused on landownership because land is the most important component of wealth in rural Bangladesh, and it is easily measurable and verifiable. We used the second question on skipping meals to avoid professional, non-agricultural households (who may not own much land, but who are comparatively well off). Our census data suggest that about 57% of households in these villages were eligible to receive the intervention after applying these two criteria." Akram, Chowdhury and Mobarak 2017, Pg 7. Eligibility criteria in the 2008 RCT: "The two districts where the project was conducted (Lalmonirhat and Kurigram) represent the agro-ecological zones that regularly witness the monga famine. We randomly selected 100 villages in these two districts and first conducted a village census in each location in June 2008. Next, we randomly selected 19 households in each village from the set of households that reported (a) that they owned less than 50 decimals of land, and (b) that a household member was forced to miss meals during the prior (2007) monga season. [footnote] Seventy-one percent of the census households owned less than 50 decimals of land, and 63% responded affirmatively to the question about missing meals. Overall, 56% satisfied both criteria, and our sample is therefore representative of the poorer 56% of the rural population in the two districts." Bryan, Chowdhury and Mobarak 2014, Pgs 1677-78. Evidence Action comment on a draft of this review, November 9, 2018. The loan amount of 1500 taka is built into No Lean Season Budget Projections, unpublished tab. We use the currency conversion rate 1 USD / 80.22 Bangladeshi taka, as used in No Lean Season Budget Projections, unpublished tab. "The basic form of our intervention was the offer of a cash grant worth 1,000 Taka (&dollar;13.00 USD) to rural households in northern Bangladesh to cover the round-trip cost of travel to nearby cities where there are job opportunities during the lean season. This was a conditional transfer, where the subsidy is conditional on one person from the household agreeing to out-migrate during the lean season. As offers were made, we let households know that they may have a better chance of finding work outside of their village, but we did not offer to make any connections to employers. No requirement was imposed on who within the household had to migrate, or what city they had to go to." Akram, Chowdhury and Mobarak 2017, Pgs 6-7. "Seven hundred three households in 37 randomly selected villages were offered cash of 600 Taka (∼US&dollar;8.50) at the origin conditional on migration, and an additional bonus of 200 Taka (∼US&dollar;3) if the migrant reported to us at the destination during a specified time period. We also provided exactly the same information about jobs and wages to this group as in the information-only treatment. Six hundred Taka covers a little more than the average round-trip cost of safe travel from the two origin districts to the four nearby towns for which we provided job information. We monitored migration behavior carefully and strictly imposed the migration conditionality, so that the 600 Taka intervention was practically equivalent to providing a bus ticket. The 589 households in the final set of 31 villages were offered the same information and the same Tk. 600 + Tk. 200 incentive to migrate, but in the form of a zero-interest loan to be paid back at the end of the monga season. The loan was offered by our partner micro-credit NGOs that have a history of lending money in these villages. There is an implicit understanding of limited liability on these loans since we are lending to the extremely poor during a period of financial hardship." Bryan, Chowdhury and Mobarak 2014, Pg 1678. "We randomly assigned the 133 villages into three groups: (a) Low Intensity – 48 villages where we targeted migration subsidies to roughly 14% of the eligible (landless, poor) population. This is comparable to the Bryan et al. (2014) treatment. (b) High Intensity – 47 villages where we targeted roughly 70% of the eligible population with migration subsidy offers. (c) Control – 38 randomly selected villages where nobody was offered a migration subsidy. "The high vs. low intensity design was chosen to generate significant variation in the size of the emigration shock, but the precise target (14% vs 70%) varied a little across villages within treatment arms. This is because our village population estimates were dated (from 2008) for most (100) villages, and imprecise in the 33 other villages, which made it difficult for us to precisely estimate the ratio (offers/eligible population) in each village." Akram, Chowdhury and Mobarak 2017, Pg 7. "(a) Low Intensity – 48 villages where we targeted migration subsidies to roughly 14% of the eligible (landless, poor) population. This is comparable to the Bryan et al. (2014) treatment." Akram, Chowdhury and Mobarak 2017, Pg 7, referring to the treatment in the 2008 experiment published in Bryan, Chowdhury and Mobarak 2014. In 2014 villages treated with cash at low intensity, migration rate was 24.8 percentage points higher than the average migration rate in the control group (34.2%). In villages treated at high intensity, migration rate among those offered was 39.8 percentage points higher than the average migration rate in the control group. Table 1, Akram, Chowdhury and Mobarak 2017, Pg 36. For comparison: in the 2008 RCT, in treatment villages (all at low-intensity), migration rate among those offered was 23.0 percentage points higher in the cash treatment group than in the pure control group (36.0%) and 20.8 percentage points higher in the credit treatment group than in the pure control group. Bryan, Chowdhury and Mobarak 2014, Pg 1683. In 2014 villages treated with cash at low intensity, total income among those offered was 2,589 taka higher than the average in the pooled control group (23902.688 taka). In villages treated at high intensity, total income among those offered was 2,105 taka higher than the average in the pooled control group. Table 5, Akram, Chowdhury and Mobarak 2017, Pg 41. "In the 68 villages where we provided monetary incentives for people to seasonally out-migrate (37 cash + 31 credit villages), we sometimes randomly assigned additional conditionalities to subsets of households within the village. A trial profile in Figure 2 provides details. Some households were required to migrate in groups, and some were required to migrate to a specific destination. These conditionalities created random within-village variation, which we use as instrumental variables to study spillover effects from one person to another." Bryan, Chowdhury and Mobarak 2014, Pgs 1678-79. "All of the implementation activities – the offers and marketing, grant disbursement, and monitoring to ensure adherence to the conditionality, were conducted by RDRS, a local NGO with 40 years of engagement in Rangpur, and substantial presence in the region." Akram, Chowdhury and Mobarak 2017, Pg 8. "In August 2008, we randomly allocated the 100 villages into four groups: Cash, Credit, Information, and Control. These treatments were subsequently implemented on the 19 households in each village in collaboration with PKSF through their partner NGOs with substantial field presence in the two districts." Bryan, Chowdhury and Mobarak 2014, Pgs 1677-78. "IPA worked with eight partner NGOs (including RDRS) under Palli Karma Sahayak Foundation (PKSF), an umbrella microfinance organization and a government agency. The 100 villages were divided between those eight NGOs." GiveWell's 2017 site visit to No Lean Season, p. 22. Our team focused on two aspects when monitoring the survey: (1) ensuring all households in each village were visited during the survey, and (2) verifying data collected during the household survey, and that was used to select eligible households, was accurate and of good quality. Household survey activities were found to be comprehensive. 99.9% of households were verified as included in the targeting survey conducted by the Migration Organizers. Self-reported data was verified and nearly 75% of eligible households were verified as eligible. The remaining 25% may have been false positives or false negatives but we cannot conclude with certainty. This phase is planned to be implemented in a similar manner in 2018[.]" We have not yet published the more detailed documents and datasets that No Lean Season shared with us. See also GiveWell's 2017 site visit to No Lean Season, Pgs 8-9. "We can wait for your decision until November 30 this year, unless you live in a village that is far from a Branch Office. If that is the case, we will organize another group meeting in your village where you will be able to get the loan instead of having to travel to a Branch Office. However, those who have taken a decision already, please tell me your name. I will make sure that we have a faster disbursement for you. If you are interested, you are welcome to come to our Branch Office between to receive the loan. Before that, however, I will come back to your village again to fill out a short loan application form for those who are interested. When you come to the Branch Office to collect the loan, you must bring your National ID Card with you. Anytime between August and November, you can come to the Branch Office to get the loan amount. But just ONE DAY before coming, please give me a phone call so that I can arrange the money for you. […] If you want this migration loan for another working member of your family (instead of yourself), please bring him/her with you to the Branch Office. Please make sure that s/he is 18 or more years old and s/he brings a copy of his/her National ID Card with him/her too. If that member doesn't have any National ID Card, please ask him/her to bring his/her Birth Certificate/ Voter Number document. The money will be disbursed only to the person who will apply and ideally, the same person would migrate afterwards. It is not possible to get the money on someone else's behalf." No Lean Season 2017 Offer Meeting Script, p. 3. "Beneficiaries come to the nearest branch office for disbursement of their loans unless their village is more than 12 kilometers from the branch office, in which case RDRS staff go to the village to do the disbursement." GiveWell's 2017 site visit to No Lean Season, p. 5. A Migration Organizer, branch manager, and accountant were present at the disbursement we observed during our site visit: "At the first table, the branch manager and a Migration Organizer went through the CommCare script with the beneficiary, entered information into CommCare, and all three of them signed off on the loan. The information entered into CommCare was written on a piece of paper which the beneficiary handed to the accountant at the next table, which the accountant kept and entered into a paper registry. At this table, the beneficiary buys a duty stamp from RDRS for 10 taka to put next to their name on this registry." GiveWell's 2017 site visit to No Lean Season, p. 6. For villages that are far from a branch office, RDRS organizes disbursement days in the village, however, Evidence Action told us that loans that are disbursed in villages account for less than 1% of the total (Karen Levy, Varna Sri Saman, and Natalie Duarte, No Lean Season staff, conversation with GiveWell, June 11, 2017). In a comment on a draft of this review on November 9, 2018, Evidence Action told us that there are two (rather than three) RDRS staff present during all disbursements. We have not yet followed up to clarify which staff members this refers to. For observation you will monitor whole process, so you have to stay from beginning to until the end for that day. Please record information carefully, this is very sensitive. However, our maximum target is 10 post participant surveys each day. So you don’t need to survey people after 50th. But stay whole time for the observation survey." Evidence Action summarized the findings as follows: "Similar to offer verification, disbursement verification involved two activities: (1) an observation of a random sample of disbursement days, and (2) post-disbursement surveys with randomly selected loan recipients on the day of observation. Observations were conducted by independent enumerators and data was collected on the disbursement protocol. Post-disbursement surveys were also conducted by independent enumerators and collected information on the loan recipients’ disbursement experience and knowledge about the terms of the loan.On average, the data suggests most disbursements were conducted according to protocol. All MOs and Branch Office staff ensured the recipients were 18 years or older and checked to ensure the applicant and the loan recipient were the same person. However, there was a small average slippage rate of 6%, similar to 2016. The post-survey data suggests most recipients understood the loan disbursement process but there was some confusion around the terms of loan repayment. In 2018, we have reviewed the offer and disbursement scripts to ensure this information is clearly delivered." We have not yet published the more detailed documents and datasets that No Lean Season shared with us. "Coercion was difficult to capture in self-reported data. Households seems reticent to provide constructive feedback of the loan repayment process." No Lean Season data verification protocol, Pg 20. Migrants sent/brought home an average of nearly 11,000 taka during their migration period. [...] Household verification data was collected during these final activities by independent enumerators from a random set of loan recipient households. The table below provides high-level results from this data. The data suggests most loan recipient households sent a migrant, the migrant was over 18, and the migrant was the same individual as the loan recipient. Moreover, the final average repayment rate in the verification data was 89%. These data are closely aligned with the administrative data." Listed as "Research and evaluation - broader learning agenda in Bangladesh" and "Research and evaluation - broader learning agenda outside of Bangladesh"